Trip 28 Oct 1-7 Ultra Limited Load (6-day) is off and running! 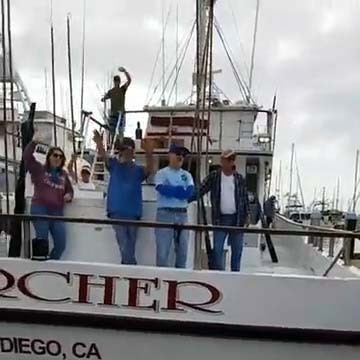 The 13 passengers on the Ultra Limited Load 6-day had to show up early for check-in this morning – based on recent determination by our captains to include Guadalupe Island as a fishing destination on this trip! The excitement level was high, with many scrambling to purchase heavy test fluorocarbon for their tackle box arsenal! Keep up to speed with our return to “the Lupe“: we will be posting all reports from the field HERE, for you! Trip 27 Sep 24-Oct 1 (7-day) is off and running!